Today, I'm reviewing the original version of The Nutty Professor (1963) starring Jerry Lewis and Stella Stevens. This article is part of the Movie Scientist Blogathon hosted by Christina Wehner and Silver Screenings. The lovelorn chemistry professor Julius Kelp (Lewis) falls under the lonely scientists section of the blogathon. 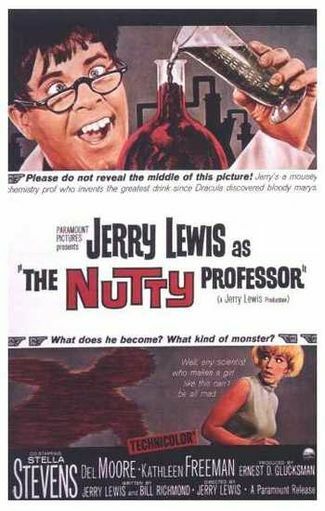 Jerry Lewis best movie, The Nutty Professor (1963), is a comic twist on the timeless horror story Dr. Jekyll and Mr. Hyde. The film is often riotously funny, but it also deals with serious themes like the true nature of our identity and the desire among all of us to be loved for who we really are. The Nutty Professor tells the story of nerdy chemistry professor Julius Kelp. Kelp is a brilliant scientist, but his habit of conducting explosive experiments and his strictness in the classroom have not endeared him to either the faculty or the students at the university where he works. When Julius develops a crush on a beautiful blonde student (Stella Stevens), he decides to create a formula that turns him into Buddy Love, a suave lounge singer who soon develops a devoted following on campus. The Nutty Professor is a retelling of the novella Dr. Jekyll and Mr. Hyde by 19th century Scottish author Robert Louis Stevenson. The classic horror tale had already been filmed three times -- John Barrymore, Fredric March, and Spencer Tracy did the honors in the earlier films -- but Lewis decided to put his own comic twist on the project by creating two unique characters that spoke to his own show business past. The nebbishy Julius Kelp is a slightly different take on Lewis' familiar comic persona, while Buddy Love, a handsome ladies' man who knows how to mix a mean cocktail, is reminiscent of Lewis' former partner Dean Martin. Lewis toyed with making The Nutty Professor for years, but he did not think he had the skills to direct and star in such a film (Lewis also co-wrote the script with Bill Richmond) until after he completed The Errand Boy in 1961. Lewis, who always liked to consider himself a comic auteur in the mold of Charlie Chaplin and Buster Keaton, gradually began directing his own films after he split with Martin in the late 1950's. At first, Lewis' solo films were directed by Looney Tunes veteran Frank Tashlin, but Lewis wanted more freedom to explore his own ideas. In 1959, Paramount Pictures, who liked Lewis' ability to complete his projects on time and under budget, gave him a lucrative contract to direct and star in his own movies, and The Nutty Professor was the fourth film under that deal. Jerry Lewis directs Stella Stevens in The Nutty Professor (1963). Lewis' reputation as a director is a somewhat mixed bag. While some critics revere him as a brilliant auteur -- Lewis has an almost godlike status among French cinephiles -- others feel that his work is too fussy and filled with self-indulgent, overlong gags Even so, most critics agree that The Nutty Professor is Lewis' best film. It is fairly fast-paced for a Lewis' movie, clocking in at a breathless 107 minutes, and the film is filled with inventive visuals from a flashback to Julius' troubled childhood to a brilliant laboratory scene that recalls the best of thirties horror movies. Lewis' direction of The Nutty Professor is spot on, but his performance in the film is even better. It would be a difficult feat for any actor to play both the awkward Julius and the arrogant Buddy in the same movie, but Lewis often has to switch between the two characters in the same scene, and he is flawless every time. 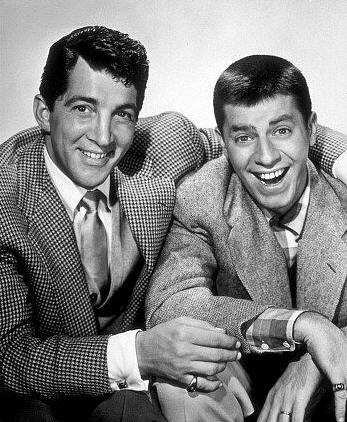 While Julius is an extension of Lewis' familiar man-child act, Buddy Love is often seen as a parody of Dean Martin; however, Lewis always forcefully denied this. He said Buddy Love was a parody of several show business types that he met over the years, and, for the most part, I think Lewis' comments are genuine. Martin was a handsome ladies man who wore snazzy suits, but he was much more laid back than the Buddy Love character is in the film. In fact, I think Buddy is actually a parody of Martin's fellow rat pack member, Frank Sinatra. Buddy's Jersey accent, which is often peppered with sixties slang ("hey, chicky baby"), and his frequent performances of "That Old Black Magic" -- a song that is strongly associated with Ol' Blue Eyes -- all points to Sinatra with a little smidgen of Dean thrown in for good measure. Dean Martin and Jerry Lewis in 1950. Whoever Lewis was impersonating, audiences and critics loved The Nutty Professor, and it was one of the biggest hits of 1963. Lewis continued directing until the 1990's with mixed success, but The Nutty Professor has been his most enduring creation. Lewis played a caustic version of the Buddy Love character in director Martin Scorsese's 1982 film, The King of Comedy, and, during his annual Labor Day telethons, Lewis often behaved quite a bit like Buddy Love, especially when he sat down at the piano to warble "That Old Black Magic." There were also two hugely successful remakes of The Nutty Professor starring Eddie Murphy, and even a musical with songs by Marvin Hamlisch that was directed by Lewis himself. I'll leave you with a funny video that features some of the best scenes from the movie. The Nutty Professor is available on DVD, Blu ray, and video on demand. This sounds absolutely hilarious! I haven't seen much of Jerry Lewis (mostly, I've seen him with Dean Martin), but I love all things Jekyll and Hyde. It will be interesting to look at his Buddy Love as a parody of Frank Sinatra. Julius Kelp is one of the best movie names ever, no? I haven't seen this version (saw the Eddie Murphy version), but you make Lewis' version sound appealing. It was a brilliant idea to take the old Jekyll & Hyde story and turn it inside out. Thanks for sharing all your research with us, to give us the behind-the-scenes story. 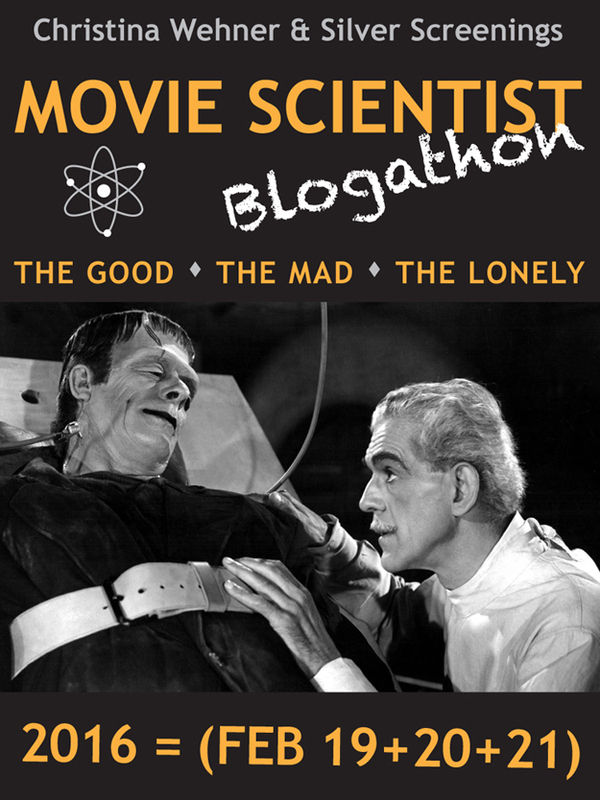 Thanks also for joining the blogathon, and for bringing The Nutty Professor with you! Yes, Julius Kelp is a great movie name, and Lewis just walks, talks, and acts exactly like a Julius Kelp throughout this movie. I agree that "The Nutty Professor" is a fine example of all of Jerry's comic skills behind the scenes and onscreen coming together magically. One of the things I admire about Jerry's solo work is his commitment to using the old character actors we love like Kathleen Freeman, Hans Conried, Neil Hamilton, Alvia Allman, etc. Agreed. Both Del Moore and Kathleen Freeman are great in The Nutty Professor. I have never seen this film in it's entirety but my dad watched it pretty much every time it's on so I feel as if I've seen it. I had no idea Lewis became a director! Great post! I guess I need to watch this thing from start to finish! I never thought of it before, but the way Buddy Love dresses and his hairdo are a lot like Elvis. Love this movie. Its mixture of hilarity and pathos is incredible. Jerry Lewis gets a bad reptutation, but I adore him. Great post! I agree that Lewis is a great director, and I know this is the out of the box opinion, but I think the The Nutty Professor is a really well-made film and it should be in the Criterion Collection.